Solar Volusia - Solar Installation & Solar Panels in Volusia County, FL. Solar Volusia is the premiere solar power contractor in Volusia County. We specialize in commercial and residential projects of all sizes in the Daytona Beach, Deltona, Deland, New Smyrna Beach, and the greater Volusia area. Selecting the right solar contractor for your home or business is a very important decision that cannot be taken lightly. Our customer service is the hallmark of our business. We will come to your home or business, and give you a thorough and detailed proposal that will turn your home or business from an energy sieve to a fully optimized, energy efficient green home or building. We are one of the fastest growing solar companies in the state of Florida, and our mission is to be Florida’s leader for everything solar by the year 2020! Reduces your monthly utility bills and will return your investment through savings and incentives. A clean and long-term energy solution that reduces the degrading effects of global warming. A substantial and permanent defense against the increasing utility costs from local utilities. Our techs are among the most experienced in Volusia County, and they can come to your home or business and give you a list of upgrades and services to improve your home's efficiency. They can provide you with a free solar analysis that will let you know exactly what products will be the highest returning home investment, so that you can prioritize your decisions. Imagine have a utility bill of $10 or $15 per month. With a comprehensive and structured approach to your green energy needs, not only is this possible, but it is what you should expect. Put the mighty Florida sun to work for you and your home, and the amazing savings will start to pile up. 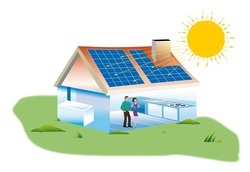 Solar Volusia can install a solar power system (photovoltaic or PV technology) that will harness the power of the sun to convert those blazing solar rays into electricity that will put money in your pocket. This system is installed as solar panels, and these are the mechanism that will save you money on your power bill and also reduce your footprint on the environment. Two priorities that everyone should have. Another extraordinary benefit that you can realize down the road, is producing more solar power than your home or business even requires. Many of our customers have achieved this enviable position, and are then able to sell the extra juice back to the utility company. Wouldn't that be nice! Our techs will also provide you with the all-important financial incentives from the state of Florida that will truly make these decisions and investments easier to deal with. There is a reason that government entities encourage green investment...everyone wins in the long term, including Mother Earth. At Solar Volusia, we understand the value of protecting your green energy investment. We will advise you on the best practices to make sure your new system will have the proper long-term maintenance plan. If you have an existing solar system that you feel is underperforming, we can provide a free analysis to measure its performance. If there is a problem, we have the finest service team in the Volusia area, and can provide a cost-effective plan to get your system working again at peak performance. Our service area is all of the Volusia County area, including Daytona Beach, Port Orange, Palm Coast, Ormond Beach, Deland, New Smyrna Beach, Ponce Inlet, Daytona Beach Shores, and more. Call us today at 386-319-5777 for your free quote, and take the first step to make smart investments in your home, as well as your financial future.